Home Business MoU signed for operationalizing the Electronic I-Form. MoU signed for operationalizing the Electronic I-Form. 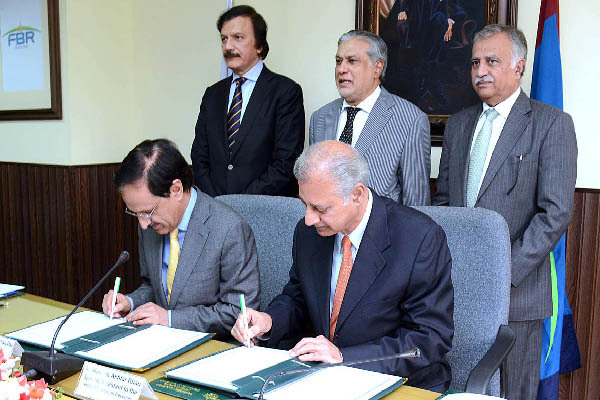 ISLAMABAD, Aug 9 (APP): Finance Minister Senator Muhammad Ishaq Dar Tuesday witnessed the signing Ceremony of Memorandum of Understanding (MoU) between Customs Department and the State Bank of Pakistan (SBP) for operationalizing electronic I-Form. The use of I-Form would curb the menace of under-invoicing and transfer pricing in addition to integrating the foreign exchange accounting system of the SBP with Customs clearances, said a statement issued on Tuesday. Senator Muhammad Ishaq Dar on this occasion appreciated the efforts of the Special Assistant to the Prime Minister (PM) on Revenue Haroon Akhtar, Chairman FBR Nisar Mohammad Khan and Governor SBP Ashraf Mehmood Wathra for excellent coordination resulting in the signing of the MoU and Operationalization of the I-Form. The Finance Minister said that under the leadership of Prime Minister Nawaz Sharif the PML-N Government had successfully implemented a number of reforms and the process would continue in the future as well. Pakistan’s economy has taken off and the merger of Stock Exchange, Pakistan’s return to the international bond market and successful completion of a very tough IMF programme are proofs of the same. He stated that for the first time in history, Pakistan has successfully completed IMF’s Extended Fund Facility programme. The Finance Minister further stated that when he assumed charge, the foreign exchange reserves were not even enough to finance two weeks’ of import bill but by grace of Allah, now the foreign exchange reserves are enough to finance around five months of the import bill. He said that for the first time, foreign exchange reserves with the SBP have crossed $ 18 billion. He pointed to the confidence of the foreign investors in the economy by pointing to the FDI inflows in livestock and refrigeration industry. The Minister for Finance stated that the real goal of the government of PM Muhammad Nawaz Sharif is to consolidate the economy and not let the economic gains go waste. He lauded the efforts of Federal Board of Revenue in over achieving the target of revenue in last fiscal year and asked the FBR team to work even harder for achieving current year’s target. Speaking on the occasion the Chairman FBR Nisar Muhammad Khan welcomed the Finance Minister and stated that there has been excellent coordination between Customs Department and SBP which has resulted in the automation of the issuance of electronic I-Form. He thanked the Minister for the support and encouragement to both the departments which made automation of Customs business process possible. Ashraf Wathra, Governor, SBP recalled that such automation and coordination between the two departments of government could only be seen in the advanced countries but Pakistan is setting new parameters under the leadership of PM and Finance Minister in working towards greater national goals. Haroon Akhtar, Special Assistant to the PM on Revenue informed the meeting that the economy is revived and moving in the right direction. He assured that FBR would work even harder in the future to meet the expectations of the government of PM Muhammad Nawaz Sharif. After the meeting Chairman FBR and Governor SBP signed the MoU operationalizing the Electronic I-Form.